Windsurfing has gone through a turbulent development since it's invention by Hoyle Schweitzer and Jim Drake back in the seventies. Jim Drake had experimented already in the early stages of windsurfing with a wing, more shaped like a hangglider. A little later I had the pleasure of testing a wing developed by the innovative sail designer Andre Lefebvre. Time has gone by and the wing became a kite which finally turned out to be an appropriate alternative to accelerate a surfboard using the windpower. Since kitesurfing really started taking off about two years ago, the still relatively small kitesurfing community learned quickly that special circumstances are needed to make kitesurfing a safe and enjoyable experience. It's lonely, it's a beautiful white sand beach, hardly any person around. The wind blows slightly onshore, all the safety you want as a kitsesurfing beginner. Many days or parts of days there is ideal windforce for kitesurfing. Flat water inside the reef, waves breaking on the outside reef for the more experienced. 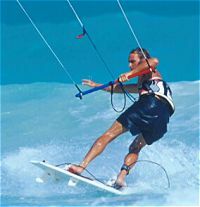 Stay at Ocean Spray Apartments and be close the some of the best kitesurfing action on the island! The ideal choice if you're looking for an authentic island escape, spacious oceanfront accommodation and a good time!